How and Where to Buy Strattera Online? Buying Strattera and its generic equivalent is easy at www.CanadianPharmacyWorld.com. Click on How To Order. As with any prescription medication, you will need to get a doctor’s prescription before you place your order. If you’d rather talk to someone over the phone about your prescription, the options available, or the details you need to get started, call us at 1-866-485-7979 and talk to one of our pharmacy professionals today. Are there Alternative Names for the Brand and Generic Strattera? Strattera is the brand name medication manufactured by Eli Lilly and the generic equivalent is called atomoxetine comes from Canada manufactured by different manufacturers including Apotex, Sandoz, and Teva. 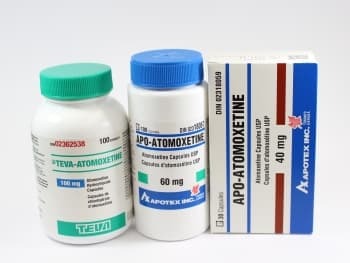 We also stock generic atomoxetine known as Axepta comes from India by Intas Pharma. We also carry other Psychiatric Medications. What Dosages and Forms is Strattera available in? Canadian Pharmacy World carries the brand name Strattera as well as the generic equivalent known as atomoxetine in a variety of dosages: 10mg, 18mg, 25mg, 40mg, 60mg, 80mg, 100mg. The medications come from Turkey, New Zealand, India, or Canada. What is Strattera used for? Strattera is used to treat attention deficit hyperactivity disorder (ADHD) by affecting chemicals in the brain that contribute to impulse control and hyperactivity. It’s meant to be taken and used in part of a total treatment plan which includes psychological, social, and/or other help. Using this medication is meant to increase the ability to stay focused, pay attention, and stop the impulse to fidget. What are the Possible Side Effects of Strattera? Before deciding if Strattera is right for you, it’s important to note that most medications will come with a few side effects. Let’s take a closer look at what you might expect. Are there any Precautions and Drug interactions of Strattera? Store Strattera at room temperature away from extreme heat and moisture. People who have taken an MAO inhibitor within the past 14 days should not take this medication, as it can have dangerous drug interactions. Children under the age of six are not approved to take Strattera. Some younger patients have documented suicidal thoughts when first starting or changing their dose of Strattera. Be sure to talk to your doctor about any changes in your mood or symptoms, including these types of thoughts. Pregnant or nursing mothers should not take Strattera without talking to their doctor. Seek emergency help or call Poison Control at 1-800-463-5060 immediately if you suspect an overdose.